It's safe to say I have a bit of a sweet tooth. Since i've been on a health kick recently i've been trying out a few recipes for the perfect healthy cookies. 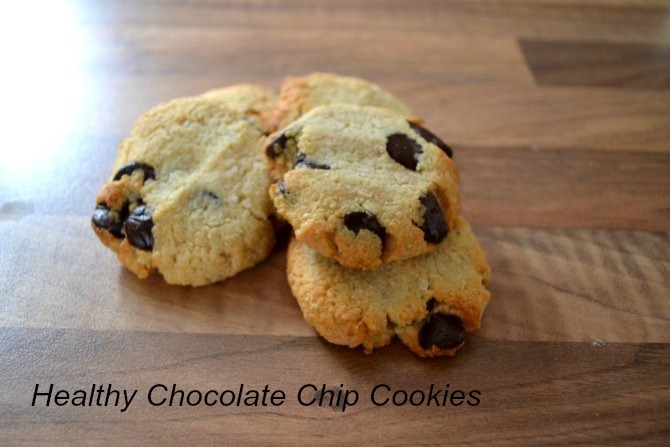 I've taken bits from a few different recipes and come up with my own and after making these a few times I think it's time to share the recipe and these cookies are super tasty! 1. Preheat oven to 180°C and line two trays with grease proof paper. Melt the coconut oil in a bowl. An easy way to do this is to put it in the microwave for 30 seconds. In a separate bowl combine the first 4 dry ingredients; the almonds, flour, salt and baking powder. 2. Once the coconut oil has cooled a little in the same bowl mix the honey, vanilla extract and water in with the coconut oil. It won't combine fully but just mix it to as best as you can. 3.Now add the wet ingredients with the dry and mix well. 4.Once everything is combined add in the desiccated coconut and chocolate chips. If you don't want to use coconut I think chopped nuts or oats would work well. The dough may feel a little wet which is perfectly normal. 5. Take a spoon or ice cream scoop and take some mixture and roll into a ball and press out into a cookie shape. Place onto the tray leaving a little space between each cookie. These won't spread too much in the oven like normal cookies. 6. Once you've got all your cookies on the tray place in the oven and bake for around 10-12 minutes. You will know they're done when the cookies are a light golden brown colour. 7. Once they're done allow to cool for around 10 minutes and enjoy! I've found these will keep for around 4-5 days in an airtight container. So that is my super easy healthy cookies recipe. I've made these a few times and they're always a big hit as they taste so good and satisfy that sweet craving without being that bad for you. The ingredients are easy to get hold of which is an added bonus. Let me know if you try this cookie recipe, I would love to hear how they turn out!